Julita Peniston is the 2008 Duperreault Fellow. Julita is a Licensed Master Social Worker, Certified Family Therapist and an International Certified Alcohol and Drug Counselor. For the past several years, Julita has gained extensive experience in New York and Bermuda providing individual, family and group counseling to adolescents, adults and their families affected by substance related challenges. 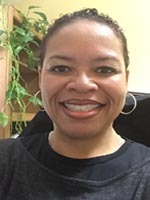 Julita is a member of the Duperreault Fellowship Committee and Delta Sigma Theta Sorority, Incorporated. Julita has provided several presentations and interviews to stakeholders in the community regarding addiction-related topics. In addition to her professional activities, Julita is an avid fitness enthusiast.